First published in Melbourne’s Child in 2007. It’s 7:30 on a Monday morning in our house. In the midst of making lunches and pulling the Sultana Bran and Fruity Bix out of the cupboard, I’m trying to get my 8-year-old to cough into a cup. Over the weekend he has developed a cough and, in our family, this is serious business. Because two of our sons have cystic fibrosis (CF) the slightest wheeze or snuffle from them rings alarm bells and send us dashing to the hospital with little sputum jars. We will see the doctor in three days to find out what, if anything, has started growing in Oliver’s lungs. Everyone has surprises in life. For our family, it was our genes. When I married my heart-throb sixteen years ago neither of us gave a thought to what was hidden in our genes. Both being tall, we knew our babies would inherit our height; maybe my reddish hair and sportiness; his brains and poor eyesight. In fact, our three boys picked up a mixture of our traits, including one we didn’t know existed. Our two eldest sons—Aidan and Oliver—carry two copies of the gene for CF, the most common serious inherited condition among Caucasians. CF leads to thickened secretions throughout the body. This can make digestion tricky, but manageable with enzymes. However, the thick mucus is very problematic in the lungs, leading to infections and permanent damage; and, often, to broken-down lungs by early adulthood. It has been eleven years since CF first entered our lives. Thankfully, our kids are far healthier than we imagined they would be and our lives are in one sense much more “normal” than we would have guessed. Having said that, there are truckloads of ways that CF affects our family life everyday; one of the oddest is diet. Shocking as it is to Oliver’s teacher, while most parents are scaling back on the butter and chocolate, at our house we’re laying it on thick. Our boys may be the only ones at their school on a high-fat, high-salt diet, but for them that’s what they need to stay healthy. CF steals a lot of energy from kids and since their digestion is not right on track they need about 150% of the calorie and fat content of their peers. So, we have become experts at picking the “healthiest” snacks and lunch items: bacon, lettuce & tomato sandwiches with a thick spread of whole-egg mayo; pizza piled high with cheese; tomato soup made with cream; crisps or nuts; avocados; full-fat yoghurt; homemade biscuits loaded with dried fruit, nuts and chocolate. To increase their salt and calorie intake they have Gatorade in their drink bottles, though the rest of their friends may be drinking water. Eating differently than your peers can be challenging and it has taken some time—and annual meetings with teachers—for it be accepted that what’s healthy for one person is not necessarily the same for another. For me, I have learned to ignore the peering eyes of health-conscious passers-by who wonder at the contents of our trolley, loaded with the high-fat foods of their dreams. Everybody has their daily routine, I tell the kids. For some it includes yoga or walking the dog. For us, it’s nebulisers and respiratory physiotherapy. Our physio involves a series of long blows into a positive pressure mask, followed by huffs and coughs. We do this whether the kids are unwell or not, to keep their lungs clear. They swallow a trail of pills throughout the day, including enzymes whenever they eat anything containing fat. It sounds like hard work, but to ensure good growth and no tummy pain, it’s worth it—and the least of our worries. Speaking of worries, as we wait for the results of Oliver’s sputum I begin to panic about what bacteria he may have grown. There’s a particularly nasty bug that affects people with CF; if Oliver has it we may need to hit hard with two weeks’ of IV antibiotics in the hospital. How will I reorganise my life and work and two other kids around the hospital? Staying out of the hospital is an on-going aim for us; one of the keys to our success is fitness. Exercise is as important for Aidan & Oliver’s health as not smoking or dining exclusively at McDonald’s is for the rest of us. So we have always made family activity a high priority, including regular long bike rides along the Yarra River, family swims, footy and soccer matches. But over the past two years something new has emerged as Aidan, our 11-year-old has started running seriously. His lung function has improved and he has been consistently healthy. Not to mention the benefit for his self-esteem in discovering that he is a good runner; in fact, good enough to finish in the Top 10 at the State Cross-Country last year. Initially running was strictly a father-son activity, until Dad injured his Achilles tendon. Without a partner to egg him on and to chit-chat during long sessions, Aidan began to lost interest and his running shoes rarely came out of the closet. 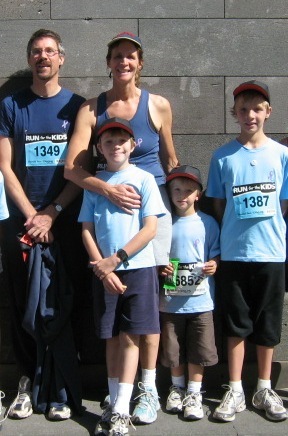 Eventually I realised that the only candidate left to re-start my son’s running campaign was me. The only problem is that I can’t run. Well, maybe “can’t” isn’t the right word: “won’t” is more accurate. At least that’s what I said until my son’s health depended on it. In the beginning my running was a joke as I was unable to make it to the end of the cul-de-sac without scheduling a break for air and water. Aidan did all the talking; I could barely breath much less discuss the progress of the Ashes. These days, eight months later, my pace is still slow and I consistently lag behind the pack while sporting an oddly uncoordinated gait. But an amazing shift has occurred in our family. When I begin lacing up my runners, everyone jumps on board. Aidan sets the pace, Oliver is gleeful that he can run faster than his mum, our 4-year-old burns along on his bike and even Dad has healed enough to join us. Runs en famille are now a regular part of our life; benefiting everyone’s health. In April we all tackled the 15km Run for the Kids, supporting the Children’s Hospital which takes such excellent care of our children. Oliver and I ran the last 2km holding hands to keep our spirits up and combat the exhaustion. But we did it, despite the screaming muscles and odds against us: me, a 40-something mum with no inherent running ability and him, an 8-year-old boy with cystic fibrosis—a lung condition! Three days have now passed since the sputum and it’s time to see our doctor. Thankfully, we get a reprieve from a hospital stay: Oliver hasn’t grown any bacteria; his cough is probably just a run-of-the-mill virus. We celebrate with two large, super cheesy pizzas for dinner. We often celebrate good health in our house—because we’re grateful and because of the challenge of maintaining a healthy optimism with CF. Cystic fibrosis has some very bleak statistics, with the average life expectancy only somewhere in the late 30s. We read the studies and attend conferences, hearing things we don’t want to hear. Yes, we know the statistics, but we don’t believe they dictate our future. How could we get out of bed in the morning if we did? Instead we tell our kids about Canadian Ironman triathlete Lisa Bentley who has won 10 Ironman races and happens to have CF. We show them stories about geriatric CF patients. We highlight research breakthroughs that are already bringing better treatments and, someday, a cure.